Updated March 2019 to version 2.0. No need to introduce KATL (Georgia, USA), the largest passenger airport in the world. It’s another airport by NAPS – Freddy De Pues & CAMI. HD standards airport by NAPS. 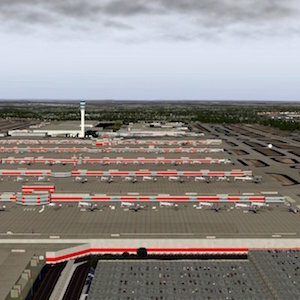 This means customized airport with many hangars, buildings, vehicles, viaducs, landmarks. Include some of Marc Leydecker’s © assets. Traffic, flows, photoshopped orthoscenery courtesy of USGS. Tested on multiple platforms.